Tooltips in the panel seem pointless to me, they hardly ever tell you more information that you can already gather by just reading the menu entry. If you are using Compiz or Beryl and have menu effects turned on, all those tooltips popping up and sparkling everywhere could get old very fast. Open a terminal and type gconf-editor. 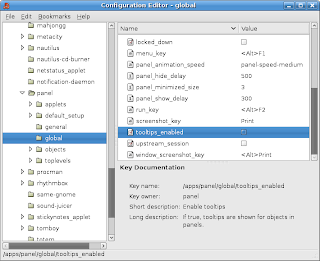 This should open the Gnome Configuration Editor. Navigate to Apps > Panel > Global and uncheck tooltips_enabled. Enjoy your tooltip-free Gnome Panel!